VRRP (Virtual Routing Redundancy Protocol) is a cluster solution where two or more Gaia-based Security Gateways work together as one Security Gateway. 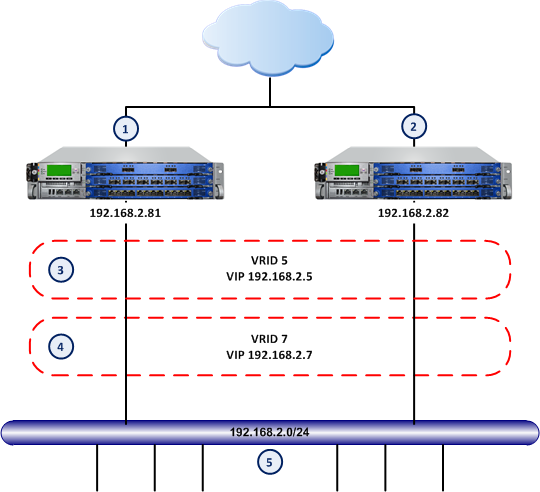 You can configure a VRRP cluster for high availability and/or load sharing. The Check Point VRRP implementation includes functionality called Monitored Circuit VRRP. Monitored-Circuit VRRP prevents connection issues caused by asymmetric routes created when only one interface on master router fails (as opposed to the master itself). Gaia releases the priority over all interfaces on a virtual router to let failover occur. Important - You cannot have a standalone deployment (Security Gateway and Security Management Server on the same computer) in a Gaia VRRP cluster. Each VRRP cluster, known as a Virtual Router, has a unique identifier, known as the VRID (Virtual Router Identifier). A Virtual Router can have one or more virtual IP addresses (VIP) to which other network nodes connect as a final destination or the next hop in a route. By assigning a virtual IP address (VIP), you can define alternate paths for nodes configured with static default routes. Only the master is assigned a VIP. The backup is assigned a VIP upon failover when it becomes the master. Nodes can have alternate paths with static default routes in the event of a failure. Static default routes minimize configuration and processing overhead on host computers. Monitored-circuit VRRP prevents connection issues caused by asymmetric routes when only one interface on a master fails (not the master itself). This problem occurs in environments where a gateway is a member of two or more Virtual Routers, typically one with internal interfaces and the other with external interfaces. Important - You cannot deploy a standalone deployment (Security Gateway and Security Management Server on the same computer) in a Gaia VRRP cluster. The procedures and explanations included in this guide are applicable to Monitored Circuit VRRP environments. The conceptual information and procedures in this chapter use standard VRRP terminology. This glossary contains basic VRRP terminology and a reference to related Check Point ClusterXL terms. A group of Security Gateways that gives redundancy and load sharing functionality. VRRP Group is an alternative term for Virtual Router. A Security Gateway using the VRRP protocol that is a member of one or more Virtual Router. In this guide, a VRRP Router is commonly called a Security Gateway. The Security Gateway (Security Gateway) that handles traffic to and from a Virtual Router. The master is the Security Gateway with the highest priority in a group. The master inspects traffic and enforces the security policy. A redundant Security Gateway (Security Gateway) that is available to take over for the master in the event of a failure. Unique Virtual Router identifier The VRID is the also last byte of the MAC address. Virtual IP address assigned to a Virtual Router. VIPs are routable from internal and/or external network resources. The VIP is called Backup Address in the WebUI. Virtual MAC address assigned to a Virtual Router. Automatic change over to a backup Security Gateway when the primary Security Gateway fails or is unavailable. The term 'failover' is used frequently in this guide. The simplified Monitored Circuit VRRP configuration contains all of the basic parameters and is applicable for most environments. When using the simple method, you configure each Virtual Router as one unit. This method uses Monitored Circuit VRRP only. For more information, see Monitored-Circuit VRRP. You cannot use the Simple and Advanced types together on the same Security Gateway. Each Virtual Router (VRRP Group) is identified by a unique Virtual Router ID (VRID). A Virtual Router contains one Master Security Gateway and at least one Backup Security Gateway. The master sends periodic VRRP advertisements (known as hello messages) to the backups. VRRP advertisements also broadcast the operational status of the master to the backups. Gaia uses dynamic routing protocols to advertise the VIP of the Virtual Router (virtual IP address or backup address). You must use monitored-circuit VRRP to configure VIP support for Dynamic Routing protocols. Note - Gaia supports OSPF on VPN tunnels that terminate at a VRRP group. Only active/passive VRRP environments are supported. Active/active environments are not supported. If the master or its interfaces fails, VRRP uses a priority algorithm to make the decision if failover to a backup is necessary. Initially, the master is the Security Gateway that has the highest defined priority value. You define a priority for each Security Gateway when you create a Virtual Router or change its configuration. If two Security Gateways have same priority value, the platform that comes online and broadcasts its VRRP advertisements first becomes the master. Gaia also uses priorities to select a backup Security Gateway upon failover (when there is more than one backup available). In the event of failover, the Virtual Router priority value is decreased by a predefined Delta value to calculate an Effective Priority value. The Virtual Router with the highest effective priority becomes the new master. For example, when an external interface fails, the master fails over only for the external Virtual Router. The master for the external Virtual Router does not fail over. This can cause connectivity problems when the internal Virtual Router accepts traffic and is unable to connect to the new external master. When using the simplified method, Monitored-circuit VRRP monitors all VRRP interfaces on the Security Gateways. When using Advanced VRRP, you configure each interface in a Virtual Router separately. If one interface on a master fails, it releases priority for all VRRP interfaces on that master. This lets the master fail over on all Virtual Routers that include the failed master. To release the priority, Gaia uses the priority delta value. This is a Check Point proprietary parameter that you define when configuring a Virtual Router. The priority algorithm subtracts the priority delta from the priority value to calculate an effective priority. If you configure your system correctly, the effective priority will be lower than the backup gateway priority in the other Virtual Routers. This causes the problematic master to fail over for the other Virtual Routers as well. Note - If the effective priority for the current master and backup are the same, the gateway with the highest IP address becomes the master. See Configuring Monitored-Circuit VRRP using the Simplified Method and Configuring Advanced VRRP for configuration details. This section shows examples of some use case VRRP environments. This is a simple VRRP high availability use case where Security Gateway1 is the master and Security Gateway 2 is the backup. Virtual Router redundancy is available only for connections to and from the internal network. There is no redundancy for external traffic. This use case shows an example of an environment where there is redundancy for internal and external connections. Here, you can use one Virtual Routers for the two Security Gateways, for internal and for external connections. The internal and external interfaces must be on different subnets. Define one Security Gateway as the master and one as a backup. This use case shows an example of an active/active load sharing environment for internal network traffic. This environment gives load balancing as well as full redundancy. Security Gateway 1 is the master for VRID 5 and Security Gateway 2 is the backup. Security Gateway 2 is the master for VRID 7 and Security Gateway 1 is the backup. The two Security Gateways are configured to back each other up. If one fails, the other takes over its VRID and IP addresses. Do these steps before you start to define a Virtual Router (VRRP Group). Synchronize the system time on all Security Gateways to be included in this Virtual Router. We recommend that you enable NTP (Network Time Protocol) on all Security Gateways. You can also manually change the time and time zone on each Security Gateway to match the other members. In this case, you must synchronize member times to within a few seconds. Optional: Add host names and IP address pairs to the host table on each Security Gateway. This lets you use host names as an alternative to IP addresses or DNS servers. If you use the Spanning Tree protocol on Cisco switches connected to Check Point VRRP clusters, we recommend that you enable PortFast. PortFast sets interfaces to the Spanning Tree forwarding state, which prevents them from waiting for the standard forward-time interval. If you use switches from a different vendor, we recommend that you use the equivalent feature for that vendor. If you use the Spanning Tree protocol without PortFast, or its equivalent, you may see delays during VRRP failover. When you log into Gaia for the first time after installation, you must use the First Time Wizard to the initial configuration steps. 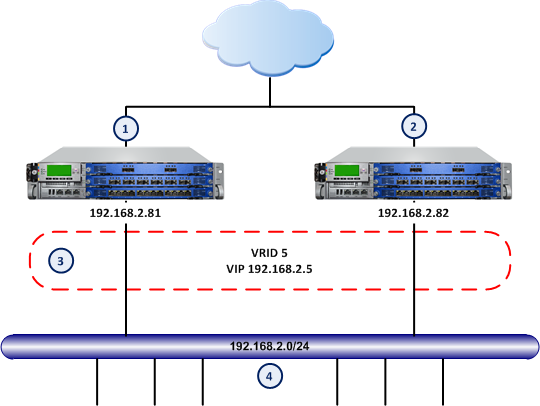 To use VRRP Virtual Routers (clusters), you must first enable VRRP clustering in the First Time Wizard. Install Gaia using the instructions in the R76 Installation and Upgrade Guide. On the First Time Wizard Products page, select Security Gateway. Do not select Security Management. The standalone environment (Security Gateway and Security Management Server) is not supported for VRRP. Select Unit is part of a cluster. Select VRRP Cluster from the list. Continue with the next steps in the wizard. When prompted to reboot the Security Gateway, click Cancel. Run cpconfig on the Security Gateway and select Enable cluster membership for this gateway. Do this procedure for each Virtual Router member. Select VRRP from the navigation tree. Make sure that the Disable All Virtual Routers option is not selected. When you complete these procedures, define your Virtual Routers using the WebUI or the CLI. This section includes shows you how to configure the global settings. Global settings apply to all Virtual Routers. Cold Start Delay - Delay period in seconds before a Security Gateway joins a Virtual Router. Disable All Virtual Routers - Select this option to disable all Virtual Routers defined on this Gaia system. Clear this option to enable all Virtual Routers. By default, all Virtual Routers are enabled. Monitor Firewall State - Select this option to let VRRP monitor the Security Gateway and automatically take appropriate action. This feature is enabled by default, which is the recommend setting for Security Gateways. Important - If you disable Monitor Firewall State, VRRP can assign master status to a Security Gateway before it completes the boot process. This can cause more than one Security Gateway in a Virtual Router to have master status. If all the Security Gateway (member) interfaces in a Virtual Router fail, all Security Gateways become backups. None of the Security Gateways can become the master and no traffic is allowed. If you change the time on any of the Security Gateways (member), a failover occurs automatically. In certain situations, installing a firewall policy causes a failover. This can happen if it takes a long time to install the policy. This section includes the basic procedure for configuring a Virtual Router. In the navigation tree, select VRRP. In the Virtual Routers section, click Add. Virtual Router ID - Enter a unique ID number for this virtual router. The range of valid values is 1 to 255. Priority - Enter the priority value, which selects the Security Gateway that takes over in the event of a failure. The Security Gateway with the highest available priority becomes the new master. The range of valid values 1 to 254. The default setting is 100. Hello Interval - Select the number of seconds after which the master sends its VRRP advertisements. The range is 1-255 seconds (default = 1). All Security Gateways in a Virtual Router must have the same Hello Interval. If you do not do this, more than one Security Gateway can be in the master state. The Hello Interval also defines the failover interval (the time it takes a backup router to take over from a failed master). You must use the same authentication method for all Security Gateways in a Virtual Router. If you select simple, enter a password in the applicable field. Priority Delta - Enter the value to subtract from the Priority to create an effective priority when an interface fails. The range is 1-254. If an interface fails on the backup, the value of the priority delta is subtracted from its priority. This gives a higher effective priority to another Security Gateway member. If the effective priority of the current master is less than that of the backup, the backup becomes the master for this Virtual Router. If the effective priority for the current master and backup are the same, the gateway with the highest IP address becomes the master. IPv4 address - Enter the interface IPv4 address. 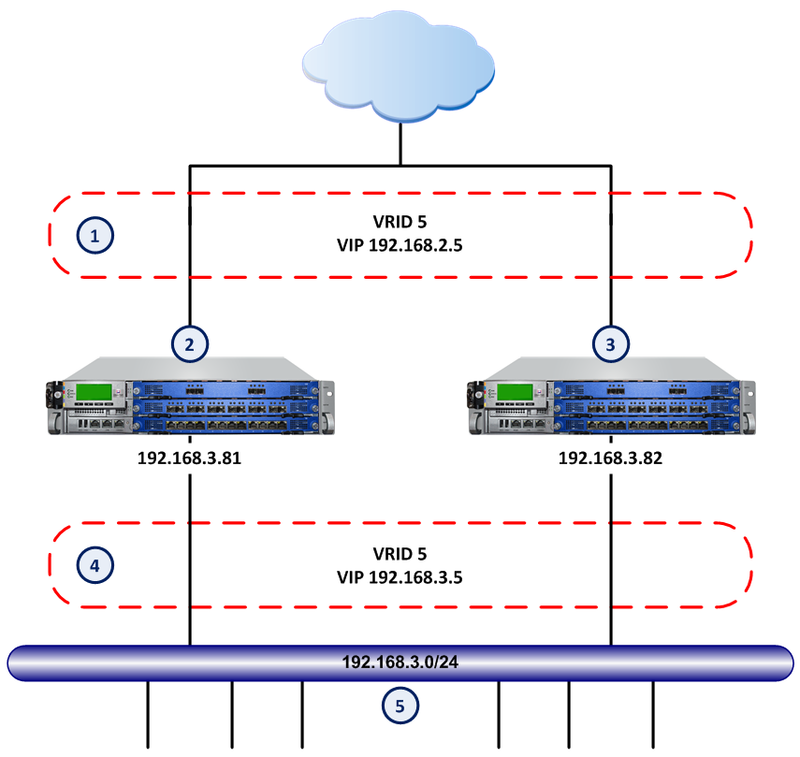 VRRP - Sets the VMAC to use the standard VRRP protocol. It is automatically set to the same value on all Security Gateways in the Virtual Router. This is the default setting. Interface - Sets the VMAC to the local interface MAC address. If you define this mode for the master and the backup, the VMAC is different for each. VRRP IP addresses are related to different VMACs. This is because they are dependent on the physical interface MAC address of the currently defined master. Note - If you configure different VMACs on the master and backup, you must make sure that you select the correct proxy ARP setting for NAT. Static - Manually set the VMAC address. Enter the VMAC address in the applicable field. Extended - Gaia dynamically calculates and adds three bytes to the interface MAC address to generate more random address. If you select this mode, Gaia constructs the same MAC address for master and backups in the Virtual Router. Note - If you set the VMAC mode to Interface or Static, syslog error messages show when you restart the computer or during failover. This is caused by duplicate IP addresses for the master and backup. This is expected behavior because the master and backups temporarily use the same virtual IP address until they get master and backup status. Click Save. The new VMAC mode shows in the in the Backup Address table. To remove a backup address, select an address and click Delete. The address is removed from the Backup Address table. Use the mcvr command to configure a basic (simplified) Virtual Router. Important - The order that you run the add mcvr commands is important. Make sure that you run add mcvr vrid VALUE priority VALUE priority-delta VALUE first. Enter a unique ID number for this virtual router. The range of valid values is 1 to 255. This is the virtual IP address (VIP) for this Virtual Router. You can define more than one address for a Virtual Router. This IP address must be on the same subnet as an interface on the physical Security Gateway. The IP address must not match the IP address for another device on the subnet. You must configure the same backup address on each physical Security Gateway in the Virtual Router. VRRP - Sets the VMAC to the format outlined in the VRRP protocol specification RFC 3768. It is automatically set to the same value on all Security Gateways in a Virtual Router. This is the default. Interface - Sets the VMAC to the local interface MAC address. If you define this mode for the master and the backup, the VMAC is different for each. VRRP IP addresses are related to different VMACs because they are dependent on the physical interface MAC address of the current master. Static - Manually set the VMAC address. Enter the VMAC address after the static-mac keyword. If the vmac-mode parameter is set to static, you enter the static VMAC address. Select the number of seconds after which the master sends its VRRP advertisements. The range is 1-255 seconds (default = 1). Enter an authentication password. This parameter is only relevant if the authtype value is set to simple. Enter the priority value, which selects the Security Gateway that takes over in the event of a failure. The Security Gateway with the highest available priority becomes the new master. The range of valid values 1 to 254. Enter the value to subtract from the Priority to create an effective priority when an interface fails. The range is 1-254. Firewalls -Simple Group object containing the firewall objects. fwcluster-object - the VRRP cluster object. mcast-224.0.0.18 - Node Host object with the IP address 224.0.0.18. If your Security Gateways use dynamic routing protocols (such as OSPF or RIP), create new rules for each multicast destination IP address. Advanced VRRP lets you configure Virtual Routers at the interface level. This section contains only those procedures that are directly related to Advanced VRRP configuration. The general procedures for configuring VRRP clusters are included in the VRRP sections. Gaia only supports the monitored circuit VRRP mode. Delete all existing Virtual Routers. Create new Virtual Routers in accordance with the procedures. Cause a failover to the backup. Reduce the priority or disconnect an interface. Delete the Virtual Router on the interface. Create new Virtual Router using the new IP address. Configure the Virtual Router as before. In the Virtual Routers section, click Add. The Add New Virtual Router window opens. In Virtual Router ID, select the ID number of the virtual router. In Interface, select the interface for the virtual router. In Priority, select the priority value. The priority value determines which router takes over in the event of a failure. The router with the higher priority becomes the new master. The range of values for priority is 1 to 254. The default setting is 100. In Hello Interval, select the number of seconds at which the master sends VRRP advertisements. The range is 1-255 seconds (1 is default). All nodes of a given Virtual Router must have the same hello Interval. If not, VRRP discards the packet and both platforms go to master state. The hello interval also determines the failover interval; that is, how long it takes a backup router to take over from a failed master. If the master misses three hello advertisements, it is considered to be down because the minimum hello interval is 1 second, therefore the minimum failover time is 3 seconds (3 * Hello_interval). In Preempt Mode, if you keep it selected (the default), when the original master fails, a backup system becomes the acting master. When the original master returns to service, it becomes master again. If you clear it, when the original master fails, a backup system becomes the acting master, and the original does not become master again when it returns to service. In Auto-deactivation, if you keep it clear (the default), a virtual router with the lowest priority available (1) can become master if no other Security Gateways exist on the network. If you select it, the effective priority can become 0. With this priority, the virtual router does not become the master even if there are no other Security Gateways on the network. If you enable Auto-deactivation, you should also configure the Priority and Priority Delta values to be equal so that the effective priority becomes 0 if there is a VRRP failure. For each Virtual Router, a virtual MAC (VMAC) address is assigned to the VIP. The VMAC address is included in all VRRP packet transmissions as the source MAC address. The physical MAC address is not used. VRRP—the default mode. Gaia sets the VMAC to the format outlined in the VRRP protocol specification RFC 3768. It is automatically set to the same value on all nodes of a Virtual Router. Interface—Gaia sets the VMAC to the MAC address of the local interface. If you select Interface mode for both master and backup, the VMAC is different for each. The VRRP IP addresses are associated with different VMACs because they depend on the MAC address of the physical interfaces of the platform that is master at the time. Note - If you configure different VMACs on the master and backup, you must choose the correct proxy ARP setting for Network Address Translation. Static—select this mode if you want to set the VMAC address manually. Then enter the 48-bit VMAC address in the Static VMAC text field. Extended—similar to VRRP mode, except the system dynamically calculates three additional bytes of the interface hardware MAC address to generate a more random address. If you select this mode, Gaia constructs the same MAC address for master and backup platforms within the Virtual Router. Note - If you set the VMAC mode to interface or static, syslog error messages are displayed when you reboot or at failover, indicating duplicate IP addresses for the master and backup. This is expected behavior since both the master and backup routers temporarily use the same virtual IP address until they resolve into master and backup. In Authentication, select None or Simple password. You must select the same authentication method for all nodes in the Virtual Router. In the Backup Addresses section, click Add to add a backup address. The Add Backup Address window opens. In IPv4 address, enter the IPv4 address. Click Save. The address shows in the Backup Address table. To remove a backup address, select an address and click Delete. The address is removed from the Backup Address table. In the Monitored Interfaces section, click Add, to add a backup address. A warning that this action locks the interface for this virtual route opens. Click OK. The Add Monitored Interface window opens. In Interface, from the drop-down list, select the interface. In Priority delta, enter the number to subtract from the priority. This creates an effective priority when an interface related to the backup fails. The range is 1-254. Click Save. The interface and its priority delta show in the Monitored Interfaces table. To edit a monitored interface, select an interface and click Edit. The Edit Monitored Interface window opens. Enter or select the new priority delta. To remove a Monitored Interface, select an interface, and click Delete. The interface is removed from the Monitored Interfaces table. Use the vrrp command to configure Global and Advanced VRRP settings. Delay period in seconds before a Security Gateway joins a Virtual Router. on or off. Enable or disable all Virtual Routers on this Security Gateway. Enter a password to authenticate the Virtual Router. on or off. On would create an effective priority 0. A virtual router with 0 priority cannot become a master. The IPv4 address of the backup Security Gateway. The number of seconds at which the master sends VRRP advertisements. The range is 1-255 seconds (1 is default). If an interface associated with a backup address fails, the value of the priority delta is subtracted from the priority to yield an effective priority for the physical router. When the effective priority on the master is less than the priority of another router in the Virtual Router, a new master is selected. on or off. If on, after a failover, the original master becomes master again when returns to service. If off, the backup system that becomes master, remains master. There is no default value. The router with the higher priority becomes the new master when a failure occurs. The range is 1-254. The default setting is 100. This section includes the procedure for configuring a VRRP cluster object in SmartDashboard. Only those procedures that are related to VRRP are shown here. In SmartDashboard, create a new cluster object using the Classic mode. Enter the VIP as the IP address. On the Cluster Members page, add the physical Security Gateways included in the Virtual Router. On the ClusterXL and VRRP page, select High Availability and then select VRRP from the list. Select all of the options in the Advanced settings section, including Use State Synchronization. On the Topology page, configure the cluster and member Security Gateway interfaces as required. Make sure that you configure the synchronization interfaces. Configure other cluster parameters as necessary. This section shows known issues with VRRP configurations and fixes. Read this section before contacting Check Point Technical Support. You can log information about errors and events for troubleshooting VRRP. Enable traces for VRRP. In the WebUI tree, select Routing > Routing Options. In the Trace Options section, in the Filter Visible Tables Below drop down list, select VRRP. In the VRRP table, select an option, and click Activate. The system restarts the routing subsystem and signals it to reread its configuration. The option you selected, its name and On/Off radio buttons show on the page. If VRRP failover does not occur as expected, make sure that the configuration of these items. All Security Gateways in a Virtual Router must have the same system times. The simplest method to synchronize times is to enable NTP on all nodes of the Virtual Router. You can also manually change the time and time zone on each node to match the other nodes. It must be no more than seconds apart. All routers of a Virtual Router must have the same Hello Interval. The Priority Delta must be sufficiently large for the Effective Priority to be lower than the master router. Otherwise, when you pull an interface for a Monitored-Circuit VRRP test, other interfaces do not release IP addresses. You can use different encryption accelerator cards in two appliances of one Virtual Router or IP cluster (such as the Check Point Encrypt Card in one appliance, and the older Check Point Encryption Accelerator Card in a different appliance). When you do, select encryption/authentication algorithms supported on the two cards. If the encryption/authentication algorithm is supported on the master only, and you use NAT, tunnels failover incorrectly. If the encryption/authentication algorithm is supported on the master only, without NAT, tunnels are not accelerated after failover. Virtual Routers must be the same on all routers in a Virtual Router. If you use Monitored-Circuit VRRP, make sure all platforms of one virtual IP address use the same VRID. The VRRP monitor in the WebUI might show one of the interfaces in initialize state. This might suggest that the IP address used as the backup address on that interface is invalid or reserved. SNMP Get on Interfaces might list the incorrect IP addresses. This results in incorrect Policy. An SNMP Get (for the Firewall object Interfaces in the GUI Security Policy editor) fetches the lowest IP address for each interface. If interfaces are created when the node is the VRRP master, the incorrect IP address might be included. Repair this problem, edit the interfaces by hand if necessary. Configure the firewall policies to accept VRRP packets on the Gaia platform. The multicast destination assigned by the IANA for VRRP is 224.0.0.18. If the policy does not accept packets to 224.0.0.18, firewall platforms in one Virtual Router take on Master state. With Monitored-Circuit VRRP, some Ethernet switches might not recognize the VRRP MAC address after a master to backup change. This is because many switches cache the MAC address related to the Ethernet device attached to a port. When failover to a backup router occurs, the Virtual Router MAC address changes to a different port. Switches that cache the MAC address might not change to the correct port during a VRRP change. Replace the switch with a hub. Disable MAC address caching on the switch, or switch ports that the security platforms are connected to. It might be not possible to disable the MAC address caching. If so, set the address aging value sufficiently low that the addresses age out each second or two. This causes more overhead on the switch. Therefore, find out if this is a viable option for the model of switch you run. The Spanning Tree protocol prevents Layer 2 loops across multiple bridges. Spanning-Tree can be enabled on the ports connected to the two sides of a VRRP pair. It can also see multicast Hello Packets come for the same MAC address from two different ports. When the two occur, it can suggest a loop, and the switch blocks traffic from one port. If a port is blocked, no security platforms in the VRRP pair can get Hello Packets from other. In which instance, the two of them enter the master router state. If possible, turn off Spanning-Tree on the switch to resolve this issue. But, this can have deleterious effects if the switch is involved in a bridging loop. If you cannot disable Spanning-Tree, enable PortFast on the ports connected to the VRRP pair. PortFast causes a port to enter the Spanning-Tree forwarding state immediately, by passing the listening and learning states. The command to enable PortFast is set spantree portfast 3/1-2 enable, where 3/1-2 refers to slot 3, ports 1 and 2.